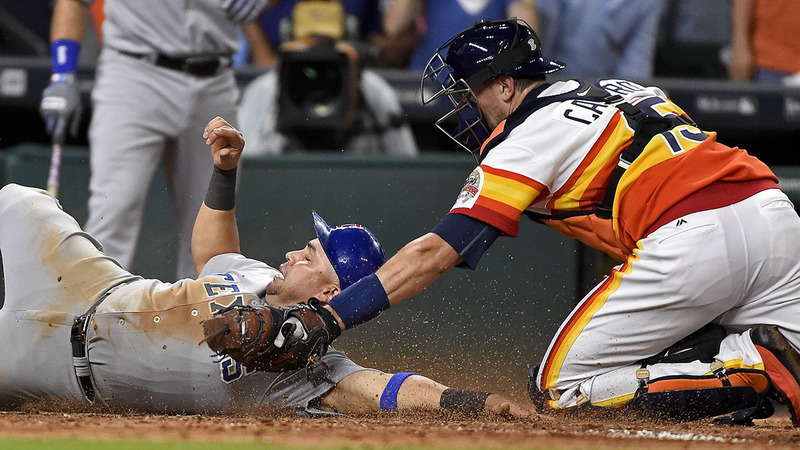 HOUSTON -- Jonathan Lucroy hit two homers, Carlos Beltran had a tiebreaking single and three hits and the Texas Rangers beat the Houston Astros 3-2 on Saturday night. The Rangers improved to 10-2 against the Astros this season and pulled 6 1/2 games ahead of Houston in the AL West. Beltran singled to left off Chris Devenski (0-3) in the seventh to score Shin-Soo Choo and make it 2-1. Beltran left after the inning with a left quad contusion. Lucroy got his second home run in the eighth off Tony Sipp for his seventh career multihomer game and first this season. Beltran and Lucroy were acquired before the trade deadline by the Rangers, and Lucroy hit his first homer with Texas in a 5-3 win Thursday. Keone Kela (2-1) pitched a perfect sixth inning, and Sam Dyson got his 24th save.